Sorry No ammunition,No live primers,No bullets,and No propellant/ powder. out preforms factory manufactured rounds !! "It's cheaper than factory ammo." "It's faster than factory ammo." "It's more accurate than factory ammo." "It's more reliable than factory ammo." "Not only all the above, But It's just a lot of fun! 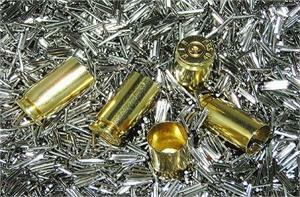 There are numerous possible reasons why shooters reload brass vs buying bullets. These reasons vary according to the needs of the shooters and their expectations of what they can achieve through reloading there own brass. Once the reloader has purchased the necessary reloading equipment, reloading once fired Brass becomes a very cost-effective way to shoot. In general, You could expect a saving of up to 50% . Although the exact saving will depend on the caliber you chose to reload. Please take note of the fact that a fired cartridge case can be reused several times (up to 15 times, depending on the caliber,Manufacture,load and type of firearm used), the cost effectiveness of reloading Brass is even further increased. Ammunition purchased from any factory produced supplier would be hard pressed to deliver anywhere near the same levels of precision and accuracy that can successfully be achieved by careful reloading Brass . That being said, it is common practice for shooters involved in bench rest shooting to demand and only use reloaded bullets. This is due to the fact that we all know this form of shooting requires extreme accuracy, and depends greatly on achieving groupings too tight to ever be obtained by factory loaded ammunition. I think we would all agree Accuracy in hunting is also required, particularly for hunting small varmint or reaching game over a long ranges. Reloading Brass allows the hunter to shoot to kill and achieve long range hits in a more reliable manner. Trust that any shooter who aims to consistently shoot within a smallgrouping (2 inches or less),would much rather make use of reloaded Brass than factory bought ammunition. This is due to the fact that factory ammunition has repeatedly shown to be ineffective at shooting a tight grouping consistently. Although there are some good ones out there so many business's these days just have a dump dirty damaged brass in box and sell attitude ! We not only sort each piece of once fired brass by manufacture head stamps one by one by hand giving a visual check for for small primer or crimp cases and berdan primed, Non loadable or cracked cases, But also with over 30 years of experience this lets me do a even more accurate audio crack check of my brass to further insure the brass you get from Brass World will be fully loadable. Yes this takes many long hours but we care about our customers and are willing to do the extra work to make sure you have the upmost satisfaction and to earn your trust for years to come. 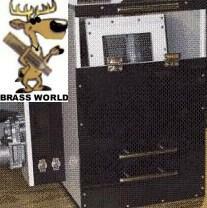 Brass World will not charge more than $8.25 shipping , Mix or match Brass calibers or products, Shipping will always be the same. New brass and sorted once fired brass is now categorized by manufacture on other pages for your shopping convenience !